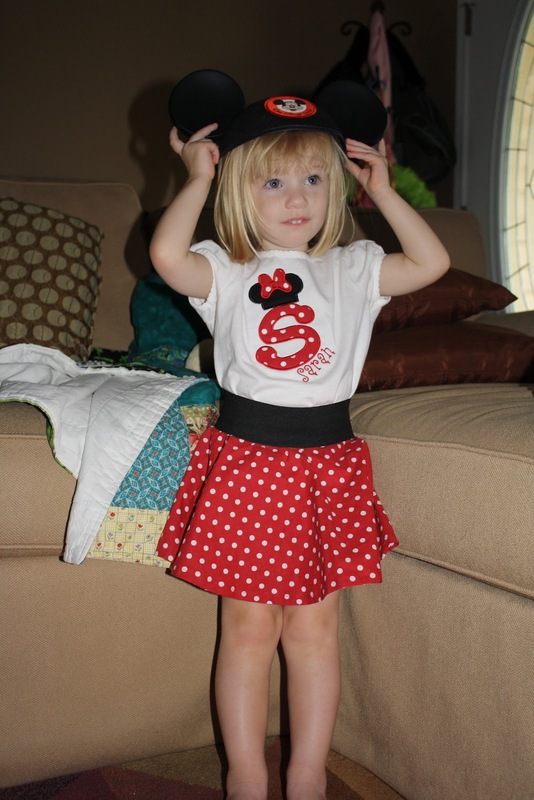 Trying on her Minnie Mouse outfit for our trip to the Magic Kingdom. We've come to the first of many milestones I'm not looking forward to. 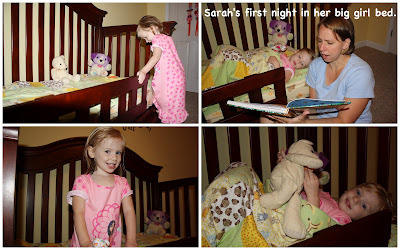 I was really hoping to keep Sarah in her crib until she was 3. Don't judge me. Sarah takes 2 hour "naps" still, and "sleeps" 12 hours at night. She goes to bed a 7 and isn't allowed to get out until 7. Do you know how I accomplished all those wonderful things. I had a toddler who didn't climb out of her crib. That's how. So I'm not really quite sure why we've made this decision, but tonight we changed her crib into it's toddler bed configuration. Well, I do sort of know how we came to this. Sarah is a chewer. I know it's hard to tell but look at the rail under the words. That's one of Sarah's many horrible chew marks on my pricey convertible crib that we invested in for her. The front panel was even worse and that's the part that is the foot of the adult size bed. Sunday, Sarah didn't nap. She doesn't always nap but she is supposed to have quite time. So I don't get to bent out of shape if she choses to talk to her stuffed animals during her nap time as long as I don't hear jumping or loud playing. However, this day she decided to chew a new hole in the foot rail of her crib. I was livid. LIVID. She got in pretty big trouble. Strike 1. Yesterday, Chris was at church doing a presentation for the cub scouts. It was time for bed and Sarah threw an ever loving fit. It was pretty horrible. But since it was bed time I did her routine checklist, said her prayer for her since she was definitely not cooperating, kissed her and put her in her bed. All the while she's kicking, screaming, and hollering at me, "no mommy wait!" For the first time ever she climbed out of her bed. I cannot begin to describe how angry I was when I turned and saw my toddler standing in the hall continuing her fit that I left her in her crib doing. She got in pretty big trouble. So much so she actually asked me to put her back in bed and didn't make another sound. I went in after I got Cody down and talked to her about how dangerous it is to climb out of her bed and hoped we'd be done with that. Climbing...strike 2. Today during nap time she wasn't napping but wasn't being very loud so I let it go. Then when I went in to get her one of her old chew marks was worse and still wet. Then I lost it. Lost it. She went to time out for 45 minutes while I took all the toys and books out of her room and pretended to throw away her lion lovey (don't just me, I already know this was not my finest moment). I pulled her mattress out of the crib and threw it on the floor and told her it was her new bed. But you know every kid loves a mattress of the floor so she was fine with it and Cody thought it was great. He climbed right up there and started playing. That backfired. Still chewing...Strike 3. So when Chris came home we talked about our options and decided to put the toddler rail on. I'm really worried about nap time. I don't know what is going to stop her from coming out of her room. I'm really not looking forward to waking up and seeing her in my face in the morning. I'm just not excited about this freedom she has now. I hope she'll use it wisely, because I am not above setting up the pack and play in her room and buying one of those crib tent things to put on it. I'll do it. I swear. Since she didn't sleep during her nap time she went down easily tonight. We made a big deal about her big girl bed. She was excited to see it and rushed into it after her bath. She didn't even get out of it to sit in my lap for her bedtime story. Before I left her room I reminded her that big girls stay in their beds. They don't get out. I hope that information sunk in. We shall see. Tomorrow's nap time will be the true test. Wish us luck. You are doing the right thing! Pretty soon she will have to get out of bed to use the potty at night anyhow and will need to be able to have that freedom.